Many people think that a good beard trimmer automatically makes a good mustache trimmer. But, this isn’t always the case. Some trimmers can be big and bulky, which don’t make good for your mustache. It’s more difficult to maintain your ‘stache with a large trimmer, so it can pay off going for something smaller and more compact. And whilst beards are getting increasingly popular year by year, many people forget that the mustache is just as important as the thicker bits. Grooming is extremely important, so it’s nice to ensure that you’re properly trimmed and neat. Whilst there are tons of beard trimmers that are available, mustache trimmers are more scarce and you need to ensure that you’re getting a trimmer small enough to keep things neat and tidy. Let’s have a look at some of the better trimmers that you can find around. The Philips Norelco Oneblade is expensive – there’s no denying that. But, it’s leaps and bounds ahead of some of the other mustache and beard trimmers that I’ve tried. And, I’m going to explain why. If you’ve ever dealt with razor burn on your neck – which I’d bet is the majority of guys – then you may be interested in the OneBlade. It’s not like a regular trimer which can cause irritation – the Oneblade simply needs to be help close to the skin to avoid this. It cuts much closer than your average beard trimmer, but not quite as close as a razor. Another good thing that I like about the OneBlade is that you don’t need to worry about whether you use it wet or dry. I personally prefer to use a beard trimmer when my face is wet, so it’s important that I get one that works with a damp ‘stache. With the cheaper options, you’re just not going to get this – if you get water anywhere near a cheaper trimmer, often they clog up. For a good mustache trimmer, you’ll undoubtedly need to buy the Oneblade with the variety of different attachments. It’s a bit more expensive, but you get 20+ attachments which make it worth it. Then means that you can trim your beard and mustache to pretty much any length with the different grades of attachments that you get. A solid trimmer that even surprised me with how good it was against the skin – perfect for those with a sensitive face. If you want something that is a bit more budget friendly, then the Fusion Proglide is a great option. i’ve had the Proglide in my apparel for many years now, and I always end up using it still occasionally. It’s small and compact, which means that it’s fantastic for travelling with. You don’t need to worry about a big bulky beard trimmer if you have the Proglide because although it’s small, it can still tackle a fairly hefty beard. As well as being a great mustache trimmer, there’s another area which I’ve struggled to find a better trimmer – sideburns. Shaving your sideburns can be frustrating, as sometimes you want to get a definitive line between the beard and your hair. Using a smaller, more accurate trimmer like this can make thing a little easier. Overall, the Proglide is one of the better budget options that makes for an awesome mustache trimmer. It might not suit you if you have a massive, thick beard but it’s a good option if you like to keep your facial hair trimmer neat and short. The Multi Groomer has been one of Norelco’s best sellers for a long time now. It’s undoubtedly one of, if not the most popular trimmer on the market. It’s ideal for those completely new to grooming. The best thing about the multi groomer is that it comes with a super wide assortment of attachments (which again, makes it ideal for young guys and beginners). Need a nose trimmer? Multi groomer has it. Ear hair getting a bit long? Well, the multi groomer does that too. If you want one item that can fit all of your grooming needs, then you can’t look past the multi groomer as a shaver. One thing that people are often impressed with the Norelco multi groomer is it’s life. Cheaper trimmers usually go bust after a year or two – that’s just the reality of using cheap electronics. This isn’t a problem with the multi groomer, as you can see from the reviews. Many people state the the multi groomer lasts them 5 or more years, as long as you take care of it with proper maintenance. An awesome option if you want a beard trimmer as well as a mustache trimmer. The multi groomer really does work for your entire face and pretty much the rest of your body, too. For the real mustache aficionados, a proper mustache kit might be exactly what you’re looking for. 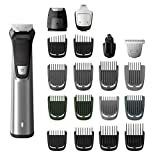 If you already have a solid beard trimmer and you’re just looking to keep your mustache neat then it can pay to just use a smaller mustache kit. The Striking Viking kit comes simply with a small pair of scissors and a mustache comb. Trimming your mustache accurate is definitely an art, and it takes time to get used to it. But of course, you need to get a specific mustache comb as opposed to a regular comb. This is because a mustache comb will help you to get those straggling hairs that most people get at the corners of their ‘stache. If you do this with a regular comb, then you’re likely to end up leaving some hairs looking out of place. Striking Viking also comes with some pretty sharp scissors, which can help to give your mustache a sharp cut. This set is similar to that you’d find in the barbers, but at a fraction of the price. Another Philips product I know – I’m sorry. But it’s just a simple fact that the Norelco range are some of the better products on the market. And, they undeniably have the widest variety of any trimmer set. The GoStyler is exactly as it says – it’s better for shorter beards and styling your face than it is for long beard. So, it’s not a good option for anyone looking for something that can tackle their entire face. Though if you’re OCD about your grooming like me, then it can pay to get something that trims close to the face. The long neck of the GoStyler may make it unsuitable for some people – it really comes down to personal preference and what you may prefer. Though in my opinion, it’s one of the better options around if you’re looking for a mustache trimmer. Everyone loves that rugged look, and the moustache is many times high on the list of preferred facial hair. At times, it just won’t grow right. The question on many men’s minds will be, why the slow development? The answers most of the time are much closer to home and it’s so easy to remedy this particular situation. First up, check your diet. Nutritionists have many times advocated that one take foods rich in vitamins A, C, E and varieties of vitamin B. This is because facial hair growth can be affected by both macronutrients (proteins, fats and carbohydrates) as well as micronutrients (vitamins and minerals). Since testosterone plays an important role in facial hair development, you will also need to ensure that your Zinc levels are up, along with vitamin D and Magnesium which will work best for you. It is advised to also maintain a proper, active lifestyle and get enough rest as that also affects your ability to grow a moustache. After an active day, your body needs enough rest to recover. It needs to rebuild, repair and grow. Therefore, as an adult you have to maintain healthy sleep patterns, clocking at least the recommended 6 hours of regular sleep. Try to relax too. Stress will usually lead to a number of issues including a weakened immune system, which will then result in a slower hair growth. Quit smoking. Smoking has a similar effect to hair as aging. When you smoke, it impairs blood circulation. This means that the capillary blood flow to the root of the hair’s root is reduced, meaning that cells are denied the vital ingredients for normal facial hair growth. Cigarettes contain thousands of chemicals which cause oxidative stress on all types of hair, as well as affecting pigmentation. If you’re having trouble growing your moustache, it’s probably time to check the habit. As mustache trimmers go, here are a few options that I’ve used personally. My favorite is likely still to be the OneBlade – I was really surpised when I used it for the first time. 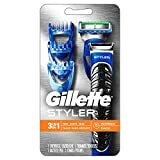 But I also still use the Gillette Fusion ProGlide pretty often too to clear up my sideburns and to keep the mustache neat. Overall, these are some of the best mustache trimmers available on the market right now and you’d struggle to find better than this small collection.